I'm hoping to make this blog more interactive by offering to make your requests. So, sweet or savoury, click on "request a bake"
A few weeks ago I noted there were lost of little moths around and I was worried they were coming from my baking cupboard so I cleared everything out. This means I’m a bit low on the standard baking items as I haven’t fully re-stocked yet. You’ll be glad to know I’ve not seen a moth since. So, that is by way of explanation for the fact that this isn’t the next bake on the list but I wanted to make a cake for my Mum’s birthday and I had the ingredients to do this one. It came out rather dense but not as dry as a feared from the look of it. Definitely needed tea or coffee with it though and works well with custard. Anyway, enough of the ‘cat ate my cheesecake’ excuses and back to the baking. I went out of order so I’ll come back to the aforementioned Roulade-Rouge. This one is a Hummingbird cake all over. Take a good cake, add a LOT of icing and then, well, let’s throw some cookies in as well. Talk about gilding the lily! It’s good though and really not that hard to make. Assemble cake. Crumble cookies on top. I am not sure what number I’m on. I think it’s 66 but I got the ingredients for what I thought was 65 (cookies and cream cake) and then realised that it should be Red Velvet Roulade. So I’m all of a dither. Anyway. I’ve made these ‘cookies’ twice now. You might wonder why the inverted commas. Well, if you’d asked me for the definition of a cookie I would have included the word said they were round and individual items. Both times I’ve baked these they’ve spread so much that I’ve ended up with several tray-sized ‘cookies’ which had to be cut into sections with a pizza wheel and then proceeded to disintegrate into a sticky, crumbly, tasty mess. Fear not though (if you were) because Wikipedia suggests that I can still call them cookies. Its definition of cookie is as follows: A cookie is a small, flat, sweet, baked good, usually containing flour, eggs, sugar, and either butter, cooking oil or another oil or fat. So, thanks Wikipedia. I’m now feeling reassured. *** KLAXON*** I’ve just googled the title of the recipe. I noticed that The More Than Occasional Baker ‘s version looked better and was comparing the recipes when I though ‘well she’s got flour in her recipe, that’ll be it’. Checking back in my recipe book there was flour in my recipe too. I can’t for the life of me remember whether I put it in. So, er, yes. That might be it. Makes 20 cookies or 3 baking tray sized ones. Melt everything meltable together hen add vanilla extract. Mix the dry stuff together. Add wet mix to dry mix and combine. Bake at 160c for 10-15 mins then leave to cool. 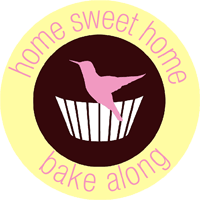 Join Beckie and me in our Epic 100 part bakealong. Next: going out of order – Red Velvet Roulade or Cookies and Cream Cake. Homes Sweet Home does tend to repeat itsself a bit. With multiple marshmallows and the same breads twice there’s a few times when I’ve thought they were being a bit cheeky. This bake is a twist on a twist though. Having made Grasshopper Slices before they’ve now taken Grasshopper Pie and turned it into a cupcake. The icing is a custard icing which makes it much less sweet. It tastes great but when you take solidified custard, try to whip it up and then fold it into whipped cream it’s hard to make it look anything less than…er… lumpy. I decided to colour it purple to make it look slightly less unsavoury! Aside from that, the normal chocolate cupcake recipe and the minty filling are pretty good. For once, I think the icing quantities were almost right. Weird. Make the custard, pour into a tray and cover with clingfilm straight away and leave to cool. Heat the cream and pour over the white chocolate, stirring until melted. Add colour and peppermint and leave to cool in the fridge. Beat the mint filling to whip it up a bit. Cut little hollows in each cupcake and fill with a tsp of the mint filling. Whip up the double cream. Beat the cold custard until smooth and fold into the whipped cream. Ice the cake with the mixture and top with crumbled cookies. Join Beckie and me in our Epic 100 part bakealong. Next: I thin it’s cookies and cream cake. This is my second attempt at marshmallows. After number 47’s failed attempt at Coconut marshmallows it was time to try again. I invested in a sugar thermometer and lots of vege gel (couldn’t find the normal gelatine crystals) and set to work. I even made a jelly with the same quantities of liquid to gelatine to check that it was going to set correctly. The jelly set. The marshmallow didn’t So, yet again I’m left with a jar of great tasting but very slumpy marshmallow fluff. And then I forgot to transfer the photos before they got deleted so you’ll have to take my word for it. Actually… I could just tell you that I made brilliant marshmallows and they worked perfectly. Yes, that’s what happened. Join Beckie and me in our Epic 100 part bakealong. Next: Grasshoppercupcakes. Below is what Wikipedia has to say about Shoo-Fly-Pie. It sounds to me like the “two versions” are a cunning plan by people who’ve baked it with varying results to justify themselves. Which I’m more than happy to get onboard with. Mine’s erring on the wet-bottom side. It’s very easy to make and like Beckie I found that there was plenty of pastry and filling for a 10inch pie dish. It looks good, it’s very sweet but not overly heavy and you can do it in stages if you want to so it’s quite a good one to fit around a busy weekend. The pie itself is a mystery – how does that filling work with only one egg and some bicarb? Who knows, but it does. Shoofly pie (or shoo-fly pie) is a molasses pie considered traditional among the Pennsylvania Dutch. The pie may get its name because the sweet molasses odor attracts flies that must be “shooed” away. The shoofly pie’s origins may come from the treacle tart with the primary difference being the use of molasses rather than golden syrup. A Montgomery pie is similar to a shoofly pie, except lemon juice is usually added to the bottom layer and buttermilk to the topping. A chess pie is also similar, but it is unlayered. Shoofly pie also comes in two different versions – wet bottom and dry bottom. The dry bottom version is baked until fully set and results in a more cake-like consistency throughout. The wet bottom version is set like cake at the top where it has mixed in with the crumbs, but the very bottom is a stickier, gooier custard-like consistency. Rub together the crumb mixture. Put all the filling mix in on bowl, whisk and then str in 2/3rds of the crumb mix. Pour into the pastry case and top with the rest of the crumbs. Bake at 140c for about 40mins or until set. Leave to cool completely before serving. Join Beckie and me in our Epic 100 part bakealong. Next: Marshmallows. Wish me luck. Beckie and I seem to back in sync for this now, despite her taking a month off the do the whole 30 (which sounds like it was a lot more enjoyable that expected). I’ve been a bit slack. Anyway, you can find her cookies here. Mine came out a bit flatter. You can’t beat a bit of PB and chocolate. They’re aasy to make and there are no ingredients that require extra supermarket shops, which is a thumbs up from me. I suppose you could also freeze them at the dough-ball stage.